The post Decoding Dog Whimpering by Stephanie Osmanski appeared first on Dogster. Copying over entire articles infringes on copyright laws. You may not be aware of it, but all of these articles were assigned, contracted and paid for, so they aren’t considered public domain. However, we appreciate that you like the article and would love it if you continued sharing just the first paragraph of an article, then linking out to the rest of the piece on Dogster.com. All dogs communicate. They bark, they howl, they cry and sometimes, they whimper. If you’ve ever wondered what dog whimpering means and why pups do it, read on. First off — is dog whimpering always negative? Is dog whimpering always negative? Photography ©Image Source | Photodisc via Getty Images. “Dogs can whimper or whine for many reasons, and while whining can be a normal behavior for some dogs when they’re excited or want something, it can also be a sign of an underlying health issue,” says Dr. David Dilmore, DVM, of Banfield Pet Hospital. According to Dr. Dilmore, dog whimpering communicates something — but that something isn’t always negative. A dog whimpering could indicate that she wants something, like a treat, a toy or that cheese stick you’re eating. Or a dog may whimper if he’s excited to go for a walk. Therefore, dog whimpering doesn’t automatically denote something bad. So, why do dogs whimper? It all comes down to context. As mentioned above, dog whimpering occurs for a multitude of reasons. They key to differentiating these different causes for dog whimpering is context. In these situations, context is everything. Is your dog whimpering in conjunction with vomiting or experiencing diarrhea? Your dog might be sick. 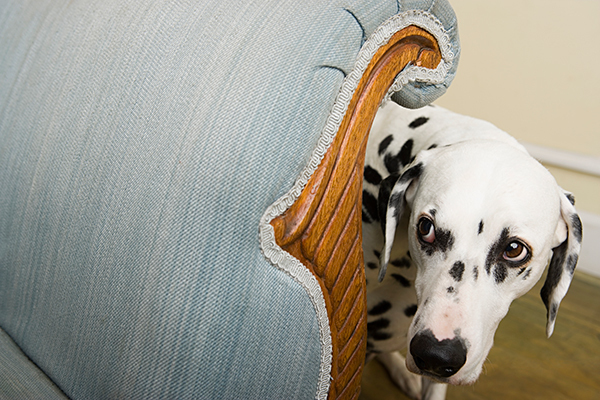 Is your dog whimpering and limping? She might be uncomfortable or in pain. Or, is your dog whimpering in the car? Sounds like he’s anxious and carsick. If your dog is whimpering while you eat at the dinner table, that might be because she “needs” — a.k.a. wants — what you’re eating, and if she whimpers when someone new walks into the house, then the whimpering might be due to excitement. It’s all about surveying the situation. 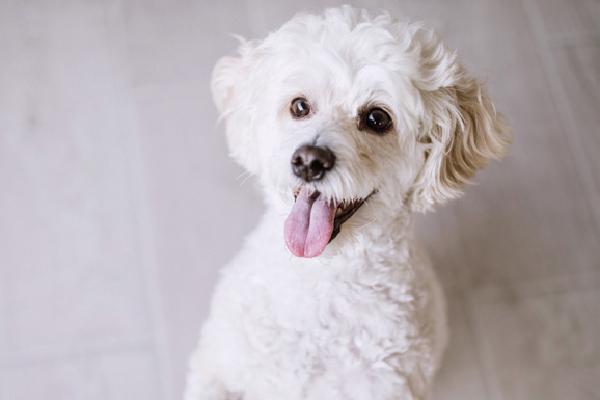 “If you notice any changes with your dog’s vocalization behavior or if you’re concerned about her health, you should take her in to see a veterinarian,” says Dr. Dilmore. Dogs can whimper when excited or while looking for attention. Photography ©Pekic | Getty Images. As Dr. Dilmore mentions, dog whimpering could mean a lot of different things depending on the situation. Below, Dr. Dilmore explains four common scenarios that cause dog whimpering and what each of them means. Sometimes an injury or another kind of underlying health issue can cause dog whimpering. Sickness — such as vomiting or experiencing diarrhea — could also be the cause of that dog whimpering. “If you notice other symptoms in your dog like not wanting to eat, vomiting, diarrhea, coughing or lethargy, she may be whining because she’s sick. If this is the case, it’s time to visit your veterinarian so they can help determine the cause of their whimpering,” Dr. Dilmore says. Anxiety isn’t just a human thing; it affects our pets, too. Some reasons that dogs might experience anxiety include traveling in the car or by airplane, thunderstorms, fireworks, a change in environment or being left alone a lot — also known as separation anxiety. “There can be many different types of anxiety in dogs that could cause whimpering, including separation anxiety or noise phobia,” Dr. Dilmore explains. “In some cases, changes in the home environment can also cause stress-related anxiety that may manifest itself in the form of whining or whimpering, whether it’s moving to a new home, a change in your work schedule, a new child or pet sibling or hosting out-of-town-guests. In some cases, your dog may need some time to adjust, but if you have any concerns or if this behavior persists, you should schedule a visit with your veterinarian to rule out any underlying health issues,” he adds. This is likely one of the most common causes of whimpering in dogs. Like babies, dogs will sometimes cry or whine to get attention or to acquire what they want, whether it’s a ball, toy, treat, food or water. Or just maybe, a whimpering dog might need to go out for a walk. When is dog whimpering a cause for concern? As you can see, sometimes, dog whimpering is just a way for our furry friends to communicate with us or with one another. But in other cases, dog whimpering is a cause for concern and requires a vet visit. Thumbnail: Photography ©damedeeso | Thinkstock. Stephanie Osmanski is a freelance writer and social media consultant who specializes in health and wellness content. Her words have appeared in Seventeen, Whole Dog Journal, Parents Magazine and more. She is currently pursuing an MFA in Creative Writing at Stony Brook Southampton and writing a memoir. She lives in New York with her Pomsky, Koda, who is an emotional support animal training to be a certified therapy dog.